This is terrible, Singapore is a signatory to CITES, and the dugong is on Appendix I – critically endangered. But then, Singapore consistently makes the grade as a wildlife smuggling hub. I am perturbed that dugong parts are being used/processed and sold in Singapore. Be a responsible consumer: Please do not buy dugong parts or products! 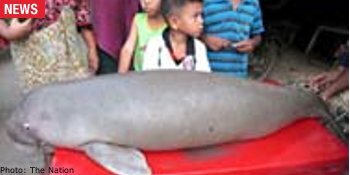 Trang’s fishermen have asked the government to strictly control the illegal dugong trade after they found many foreign mariners hunting the animals and smuggling them out to Singapore for Bt50,000 (S$2130) each, villager leader IsmaAnn Ben SaArd said. The illegal hunt is being carried out by foreign fishermen especially from Satun province. They throw bombs into cairns or near coral reefs, with the resulting explosion towing up many fish, he added. IsmaAnn explained that some wayward local fishermen have pointed out the area to foreign fishermen. Moreover, they also use seine and large fishing nets to hunt stingray and other kinds of fish two kilometers from the coast. They use a local fishhook called “Rawai” to hunt dugong, killing more than 25 of the creatures during the past month alone. Trang authorities have announced that Rawai is an illegal piece of fishing equipment for it endangers dugong and sea turtles.